Join AID for a completely new workshop format called “Meet Your Community”! 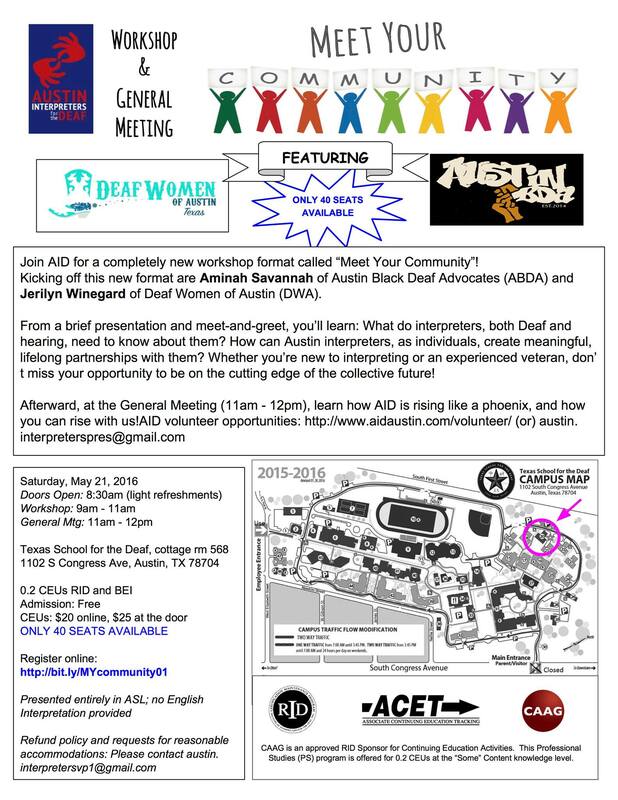 Kicking off this new format are Aminah Savannah of Austin Black Deaf Advocates (ABDA) and Jerilyn Winegard of Deaf Women of Austin (DWA). From a brief presentation and meet-and-greet, you’ll learn: What do interpreters, both Deaf and hearing, need to know about them? How can Austin interpreters, as individuals, create meaningful, lifelong partnerships with them? Whether you’re new to interpreting or an experienced veteran, don’t miss your opportunity to be on the cutting edge of the collective future! Afterward, at the General Meeting (11am – 12pm), learn how AID is rising like a phoenix, and how you can rise with us!